The walls of Manila determined its growth, marking a dividing line between the outside and the interior. This interior is known as Intramuros. 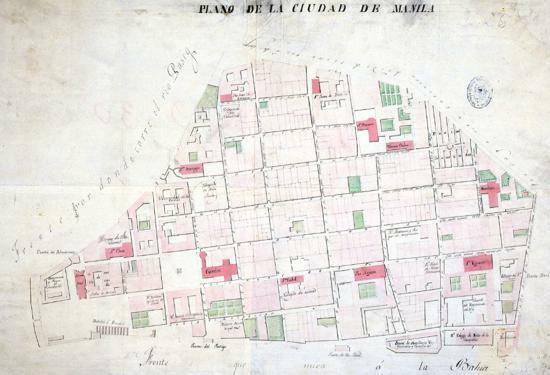 The relative importance given by the authorities to Intramuros, in relation to the rest of the city, was influential in the history of the formation and the development of Manila . 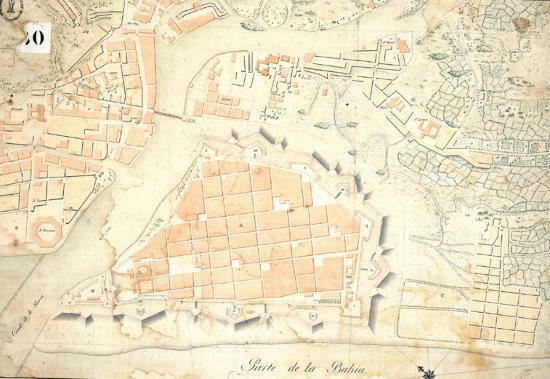 Although the perimeter of Intramuros was irregular, that did not prevent the organization of the city from being in agreement with the model used by the Spaniards in the New World: parallel and perpendicular straight streets that are crossed to form a gridiron. The resulting square or rectangular blocks; are divided as well, first in four lots, soon in more, always with fronts to the streets; the houses constructed in line with the street. The cathedral occupies an prominent place in the central plaza ; the City Hall, is also constructed in the plaza. Fires and earthquakes level the city. Intramuros, and all Manila, rises time and time again on its ruins. Its primitive layout remains. The wall limits the interior population, that never gets to be very dense : in the middle of the 17th century it contained something more than two thousand inhabitants. 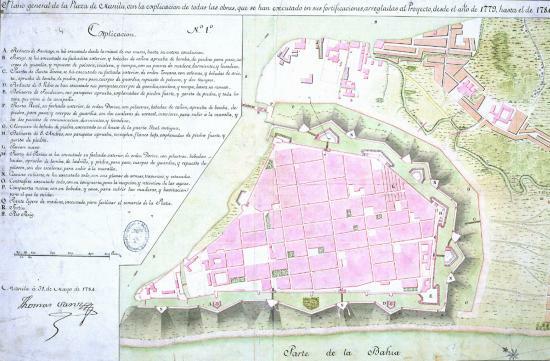 In second half of the 18th century, the increasing growth of the suburbs suspends the population of Intramuros. Manila becomes much more that Intramuros . Seat of St. Francis in Manila. Fernando Brambila. Collection of drawings and engravings of the Malaspina Expedition. 1789-1794. MN With their arrival to Manila in 1577, the Franciscans began with construction of wood and cane churches that succumbed to natural catastrophes. In 1739 they constructed a stone church that was financed by the public charity and became one of richest in Intramuros. 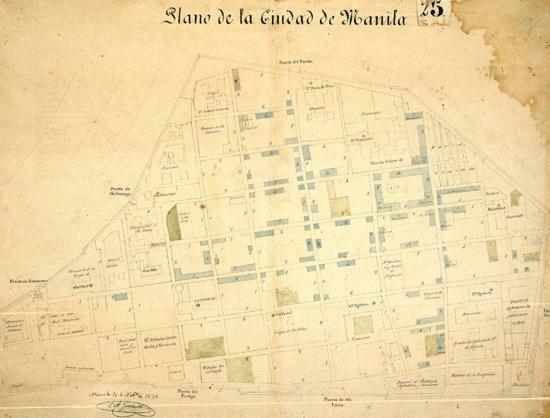 Plan of the City of Manila. Antonio Giménez. Signed by governing general military Jaudenes. 1898. SGE At the end of 19th century the urban structure of Manila was completed. The original defensive configuration stayed invariable during the Spanish time, and it is conserved at the present time. Manila Intramuros. Antonio Giménez. 1851. SHM When becoming independent of Mexico, the Philippines happens to depend directly on the metropolis. From her the overseas ministry begins to undertake a series of infrastructure works that make of Manila a modern city, "most European" of Asia. 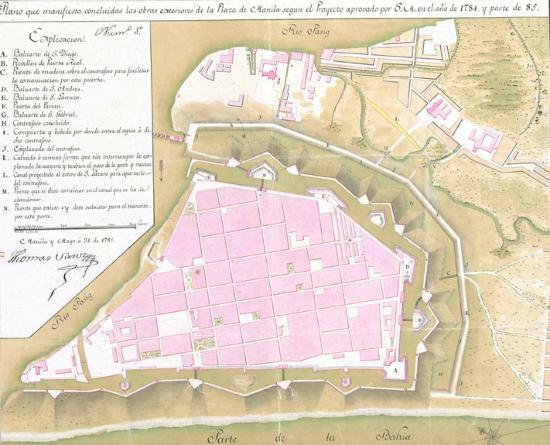 The city in 1783. AGI the history of Manila was plagued by earthquakes, fires and natural accidents of diverse nature, that forced successive reconstructions and served their constructors to carry out a better material preparation. Manila Intramuros. 1839. L.A. Garci'a. SHM During the 19th century to crystallize in Manila a peculiar and polished domestic architecture fruit of the mestization of colonial types that are adapted to the local conditions and to the appearance of a bourgeoisie that is developed at a time of freedom of commerce and greater facility in the communications. 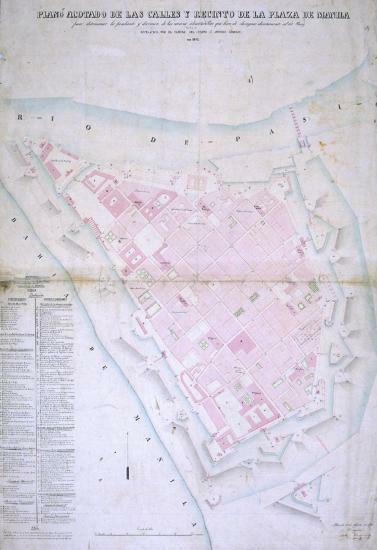 Plan of the fortified enclosure of Manila. Tomás Sanz. 1785. AGI the natural conditions facilitated the fortification of the urban enclosure, that by the side of the river counted on a natural pit and by the other it only could be attacked by sea. The only soft spot was the inner part, where the natural defense was the marshy character it of the land. 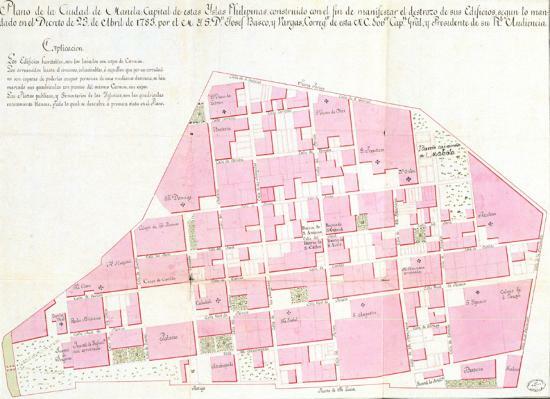 Plan of the city of Manila 1762. AGI In 1762 the city of Manila was surrounded by the English and the 5 of October it surrendered after a siege. This occupation lasted until the 31 of May of 1763, after the treaty of peace signed in Paris the 10 of February of that same year. City of Manila. Tomás Sanz. 1784. 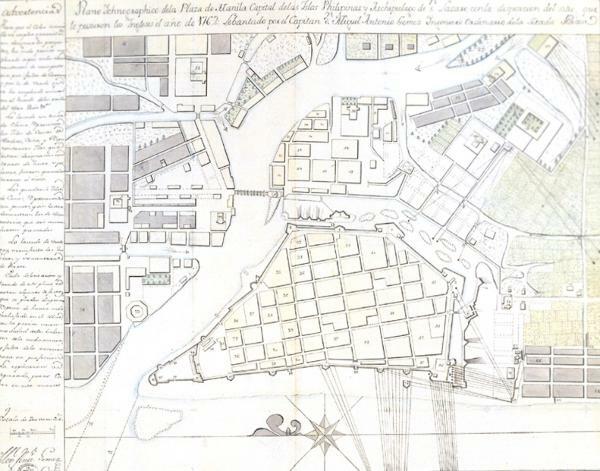 SHM the plan of the city of simple grid was not difficult to him to make the own soldiers who although did not understand of city-planning technique, this form facilitated the division and the distribution to them in lots. 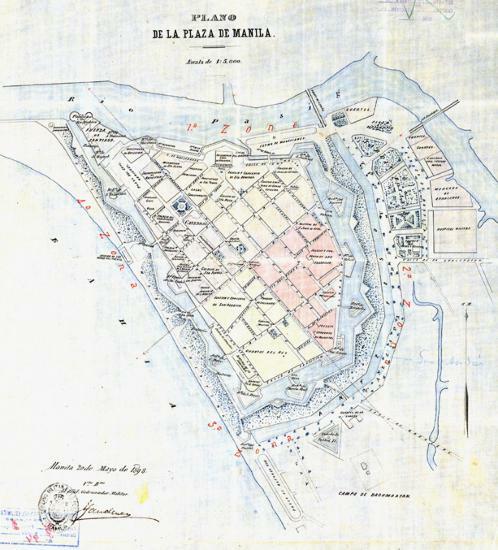 Intramuros of Manila, with the location of the most excellent buildings. Carlos Kings. 1895. SHM In the interior of the fortified enclosure, the layout of the streets followed the usual model of the checkerboard, in lines that extended from the central plaza, where were the main buildings of the Spanish dominion. The city and its suburbs. 18th Century. SHM In 17th century begins a process of growth and expansion of the towns near Manila, that consolidates in the two following centuries until being turned districts of the capital. 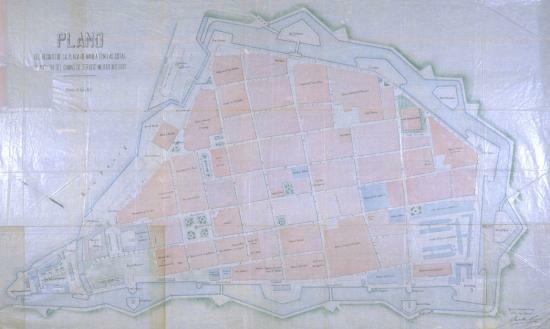 Plan of Manila where the religious buildings are specified. 19th Century SHM the religious factor was not the only influence of the colonization, but one of the determinants of the urban layout, as it demonstrates the abundance of churches, convents and schools in the interior of the walled enclosure.